I was faced with a small challenge today. I had just walked back from the gym, listening on the way to a Ted Talk by Vilayanur Ramachandran on my Ipod. I got back to my apartment and realized I needed to jump into the shower. I was faced with two options – one, I could finish the talk and jump in or I could stop it, jump into the shower and continue the talk later but I was absolutely loving his presentation and didn’t like either of those options. So i tried to figure out how I could have my cake and eat it too. There had to be a way for me to listen to my favorite podcasts in the shower. I initially thought of a waterproof dock and spent 3-5 minutes looking it up on amazon but besides the fact that I had to wait three days to get them delivered, they were way too expensive. Then I hit upon a different idea. 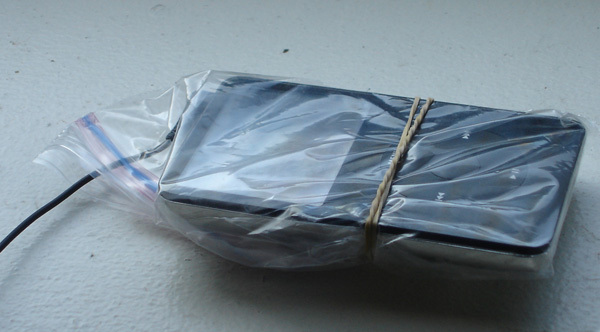 I decided to use a zip lock bag and rubber bands to create a waterproof casing for my Ipod. It worked wonderfully and I was able to listen to the brilliant presenters at Ted while in the shower. After I got out, I realized that there was something even more important that had happened. Instead of buying an expensive dock that would have a single function and purpose, I had come up with a product that was not permanent. As soon as the function of the ziplock bag and rubber band as a waterproof Ipod case was no longer needed, I could take it apart and reuse the components for other purposes. The implications of this idea in a larger scale go beyond the idea of reuse and recyclability of products. Instead, it makes us ask the question about how we as innovators can use this principle to develop products that can be broken down and reassembled for various other purposes. This entry was posted in creativity, objects, permanence, ted and tagged creativity, innovation, objects, permanence. Bookmark the permalink. is this the same method you use for magazines? Couldn’t you have left the ipod itself outside of the shower, and what about the earbuds? Eric: Magazines are easy – just face away from the water, then get rid of the magazine and shower like normal. Alex : I haven’t tried that but I’m not sure if my headphone cord is long enough.